Western Watersheds Project | Keeping Wilderness WILD! You are currently browsing the tag archive for the ‘Western Watersheds Project’ tag. This is the slightly amended written document that I worked from while giving my talk at the 50th Anniversary Wilderness Conference in Albuquerque this past October. My actual talk included some additions that I felt were important based upon what I’d already experienced at the conference and a few deletions due to the time constraint. I did begin with a brief story of a personal encounter with a sow grizzly with cubs that illustrates how much we still do not know about wildland ecosystems. The actual speech can be viewed on You Tube. My name is Howie Wolke and I live in the foothills of the Gallatin Range in southern Montana just north of Yellowstone National Park, about a mile from the greater Absaroka-Beartooth Wilderness Complex. I’ve been a wilderness guide/outfitter for backpacking and canoe trips since 1978. I am also a past President and the current Vice-President of Wilderness Watch. When I first applied to give a presentation at this conference I intended to share my thoughts about the state of our wilderness lands on the ground, given my perspective from having guided well over 500 wilderness treks. Most of these trips have been 5-10 days in duration, and after 36 years I still guide trips from the Arctic Refuge to the Gila including many areas in between. Our company’s major focus, though, are the wildlands of the Greater Yellowstone Ecosystem, my primary home range. There may be someone out there with more guiding experience than I have but if so, I don’t know who that person is. I mention this because unfortunately, my guiding perspectives will have to be shared outside the context of this panel, perhaps over a beer somewhere or at another forum. That’s because there’s little opportunity in this conference to examine as a group, with meaningful interchange, the failings of and potential remedies for, effective wilderness activism in the U.S. This is my attempt to focus at least a bit of attention on a very big problem that I will soon describe. Let me be clear: I really appreciate the staggering effort put forth by conference organizers. They’ve secured some wonderful and well-known keynote speakers, like Terry Tempest Williams, Sylvia Earle and Dave Foreman — plus some famous media people, agency leaders and politicians, and that’s fine. But there were some glaring omissions and perhaps for the next Wilderness conference we could also include folks such as Michael Soule’, George Wuerthner and E. O. Wilson (who advocates that 50% of the planet should be biodiversity reserves, way more than most of the American Conservation Movement is willing to support). I should also mention Carole King, a real wilderness activist hero in addition to being a pretty fair singer/song-writer. And perhaps future conferences could be better structured to facilitate debate and real interchange of ideas. In my mind, it is unfortunate that this very panel is competing with 11 other concurrent panels. That’s an insult. I came all the way to Albuquerque to talk to 8% of the participants? This conference is a wonderful gathering of some really great minds. But it’s very academic, not at all conducive to having wilderness advocates really examine and debate as a group where we should be going after 50 years of Wilderness legislation in the United States. The truth is that a deep malaise afflicts wildland conservation. Certainly, there are some really great activist groups out there, on the local, regional and even national levels. Such as Friends of the Clearwater, Wilderness Watch, Western Watersheds Project, Friends of the Bitterroot, Alliance for the Wild Rockies, New Mexico Wilderness Alliance, Swan View Coalition, and many more. But these outfits are routinely undercut by a relatively small cadre of big national and regional groups with big budgets, and often with obscenely big salaries for their executives. Real activism that highlights education and organizing wilderness defenders has been swept aside, replaced by collaborative efforts to designate watered-down Wilderness. That’s where the money is, so the PEW Foundation and other funders who defend the status quo dictate strategy, favoring radical compromise and collaboratives where everyone holds hands and sings Kumbaya. These collaboratives forge deals that make some people feel good but almost always the land and its creatures get the shaft. These outfits work for legislative notches in their Beltway belts, at any cost — the costs often being special provisions in Wilderness bills and radically truncated Wilderness boundaries. This creates increasingly human-manipulated and tame “Wilderness”. Unfortunately, I am not simply talking about honest differences of opinion over strategy. I’m talking about the Big Greens actively working against conservation, routinely teaming up with corporate exploiters and other anti-wilderness constituencies. There’s a fine line between strategic differences and actually working to oppose grassroots conservation; and that line is now routinely crossed. I’ll give you just a few examples, which is all that my time allotment allows, but there are, sadly, plenty more. So, of course I am disappointed but not surprised that TWS President Jamie Williams is a conference keynote, because – as I will shortly explain – his organization has turned its back both on the Wilderness Act and it’s formidable but increasingly distant pro-wilderness past. Now, before anyone accuses me of getting personal, I assure you that there is nothing personal about this. I don’t know Jamie Williams; I’ve never met him. He is probably nice man who believes that he’s working for the greater good. But I do know that his organization has abandoned its formidable history of wilderness defense and advocacy and that in The Wilderness Society, the buck stops in his office. Yet, Stewart Brandborg, former Executive Director of TWS who helped pass the Wilderness Act, was not invited to be a featured speaker here, and don’t let anyone tell you that he was, because that’s simply not true. If they really wanted him they could have got him; he wanted to come. He told me this in a personal conversation just a few days ago. But perhaps because some of the organizers knew that he was planning to strongly reprimand TWS/PEW/USFS etc., he remains in Montana. Like many of us, Brandy is truly horrified by what’s happened to the wilderness movement and he wanted me to convey that message to this group. In some ways, the problem really materialized during RARE II, when a small group of TWS and Sierra Club Washington, D.C.-based employees, I’m told led by Doug Scott (another of this conference’s keynote speakers, by the way) decided that conservationists should propose less than half of the available national forest roadless acreage for Wilderness. My old friend Dave Foreman was one of those D.C. strategists at the time, but to his credit, he later renounced the RARE II strategy of minimal proposed Wilderness. Unfortunately, out of 80 million available national forest roadless acres (62 million inventoried in RARE II), the Carter Administration, constrained by the conservation movement’s radically compromised vision, recommended just 15 million acres for wilderness designation. The dye was cast. The opportunity to define the wilderness/roadless debate on biocentric terms by advocating Wilderness for all or nearly all roadless areas was blown. Millions of wild acres were subsequently bulldozed, and with exceptions, the wilderness movement has behaved like a beaten dog ever since. The Wilderness Society has fallen far. Earlier I complained about TWS President Jamie Williams being a Keynote speaker at this conference. Here are just a few examples why: TWS has opposed the efforts of Wilderness Watch and local conservationists to keep Georgia’s Cumberland Island National Seashore wild, by supporting the National Park Services’ running motor tours through this designated Wilderness. TWS has also encouraged the BLM to allow ranchers to use ATV’s in the Owyhee Canyons Wilderness in Idaho, and it has supported an extremely absurd Forest Service plan to burn nearly the entire Linville Gorge Wilderness in North Carolina! Of equal shock value, a couple of years ago, TWS staffer Paul Spitler produced a paper entitled “Managing Wildfires in Wilderness”. That paper supported logging, road-building and bulldozing pre-emptive fire-breaks in designated Wilderness. I quote from this TWS Paper: “In short, any fire suppression activities that are allowed outside of wilderness are allowed within wilderness as well”. That is an incorrect interpretation of the Wilderness Act, arguable at best, but why is TWS working to promote rather than restrain heavy-handed management in wilderness? Do they not recall Howard Zahnisers’ poignant reminder that in Wilderness “we must be guardians, not gardeners”? And then there’s Green Mountain, in Washington’s Glacier Peak Wilderness. That’s where the Forest Service illegally replaced a dilapidated fire lookout with a brand-spanking new lookout/visitor center under the phony guise of historic preservation. Wilderness Watch sued the Forest Service and won a legal slam-dunk victory for Wilderness and for the Wilderness Act. The FS was ordered to remove the structure. But TWS again undercut conservation by working to exempt Green Mountain from the requirements of the Wilderness Act. And Congress did exactly that. Obviously, TWS is so determined to appease the agencies that they have abandoned their mission, with zeal. When Stewart Brandborg was running TWS, there were certainly strategic differences among groups, sure, but this kind of undermining could never have occurred. Back in the 60’s and 70’s TWS understood the need to support, not oppose, the grassroots. But that was a long time ago. Long before TWS saw fit to put Wilderness deconstructionist Bill Cronin on its Board of Directors. Even worse, TWS is now paying former timber lobbyist and Assistant Agriculture Secretary Mark Rey for lobbying services! Rey has a veritable history of radical anti-environmentalism and his lobbying for TWS is like the NAACP hiring the Grand Dragon of the Ku Klux Clan! Yesterday we hard speakers Chris Barnes and Ken Brower eloquently describe this problem in general terms, and suggest that first and foremost we all need to love wilderness. I suggest that we also stop hiring those who don’t! TWS is not alone at working to undermine the efforts of other conservationists. In my home region, the Greater Yellowstone Coalition (GYC) produced a display at a recent Montana Wilderness Association convention extolling the virtues of broad-scale national forest thinning/logging for nebulous and scientifically incorrect “forest health” reasons. They did this as other groups work to educate the public about the folly of the so-called “forest health” claims made by some in the Forest Service and industry. With friends like GYC, who needs enemies? And a few years ago, MWA betrayed the Central Montana Wildlands Association, a small grassroots group based in Lewistown, Montana. These folks had sued the Forest Service over a travel plan allowing snow-machines in the Big Snowies WSA. But it turns out that MWA had cut a deal with the Montana Snowmobile Association to allow snow-machines in part of the Wilderness Study Area. Then, MWA actually intervened in the lawsuit on behalf of the Forest Service and the snowmobilers, opposing the grassroots effort. You did not hear me wrong. The Wilderness Society, MWA and GYC have also refused to support a grassroots wilderness proposal for a 545,000 acre Gallatin Range Wilderness in Montana and Wyoming, and in a number of instances that I’d be happy to detail when I’m not on the clock, have intentionally undermined the efforts of a local group, Montanans for Gallatin Wilderness. A GYC representative even told us that their group wouldn’t support any more Wilderness than our Democrat Senator Jon Tester supported. Huh? TWS and its cohorts seem to forget that our job is to push, pull, cajole, embarrass and encourage the agencies and politicians to support new Wilderness designations and to keep designated Wilderness wild, even when – no, especially when – individual bureaucrats and politicians drag their heels. Our job is not to rubber stamp agency plans or to appease Congressional Democrats. We must challenge public officials whenever their actions diminish or degrade Wilderness! I could continue, but time is running short. Again, I respect strategic differences within the conservation community but what I’ve described is something entirely different. In the past I’ve counseled fellow conservationists to avoid public criticisms of other conservation groups. I thought we should not air our dirty laundry for all to see. But I’ve changed my mind. The situation has gone too far. When a wheel is broken, ignoring it won’t fix the problem. The Conservation Movement has lost its way. John Muir, Bob Marshall and Howard Zahniser spin in their graves. The malfeasance must end. I don’t know what the solution is except to say that perhaps it’s time for groups such as TWS, MWA, GYC, The Nature Conservancy (whose chief scientist Peter Kareiva argues that Wilderness has become irrelevant) and maybe some others to simply disband and get out of the way. Of course I know that this won’t happen. I also appreciate that occasionally these outfits do good work. But occasionally doesn’t cut it. Protecting our priceless heritage of both designated Wilderness and potential designated Wilderness Areas is not going to get easier as the already overpopulated United States of America continues to expand its already bloated amount of human biomass. As the U.S. population climbs toward 350 and 400 million Americans, pressures on wilderness are going to increase from every imaginable direction. Continued destructive behavior by so-called conservation groups simply exacerbates an already difficult situation. In summary, recall that Ed Abbey once wrote that “the idea of wilderness needs no defense, only more defenders”. That’s true today, more than ever. Wilderness is about restraint and humility. It teaches one that we don’t know it all and never will. There is wisdom in the rocks and the trees and the deserts, the prairies and the tundra. Wild habitats speak to us, if we listen. And one thing they tell me is to heed the wisdom of the wilderness movement’s early visionaries. Now is not the time to abandon their ship. Let’s quit playing “Let’s Make A Deal” and other political games and get on with the real job of really defending what remains wild. I realize that many people will find what I just discussed to be profoundly disturbing. I certainly do. And believe me, I would have much rather discussed what I’ve learned about wilderness on the ground from my 37 years as a wilderness guide. But I also feel strongly that to avoid this difficult discussion would have been neglecting my responsibility both to the Conservation Movement and to the Wilderness itself. Howie Wolke co-owns Big Wild Adventures, a wilderness backpack and canoe guide service based in Montana’s Paradise Valley, near Yellowstone National Park. 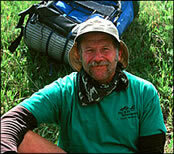 He is an author and longtime wilderness advocate, and is a past president and current board member of Wilderness Watch.